The recipe calls for 5-1/3 cups whole wheat flour, 1 T kosher salt, 1-1/4 tsp instant yeast, 3 T sugar, 2-1/3 cups water, and 3 T olive oil, mixed for 1 minute by hand or stand mixer, rested for 5 minutes to hydrate the flour, then mixed for 1 minute more. Next, the shaggy dough goes into an oiled bowl for a 10-minute rest. Here’s the interesting part: rather than rough kneading, the dough gets a gentle stretch-and-fold four times at 10-minute intervals, done directly inside the oiled bowl. The stretch-and-fold firms up the dough, transforming it from sticky/slack to barely tacky and cohesive. Then, the dough receives a long, cold ferment in the refrigerator: up to 4 days! That’s the beauty of this method: after an initial active period of about 30 minutes, the dough can be baked at any time from 1 day to 4 days later. 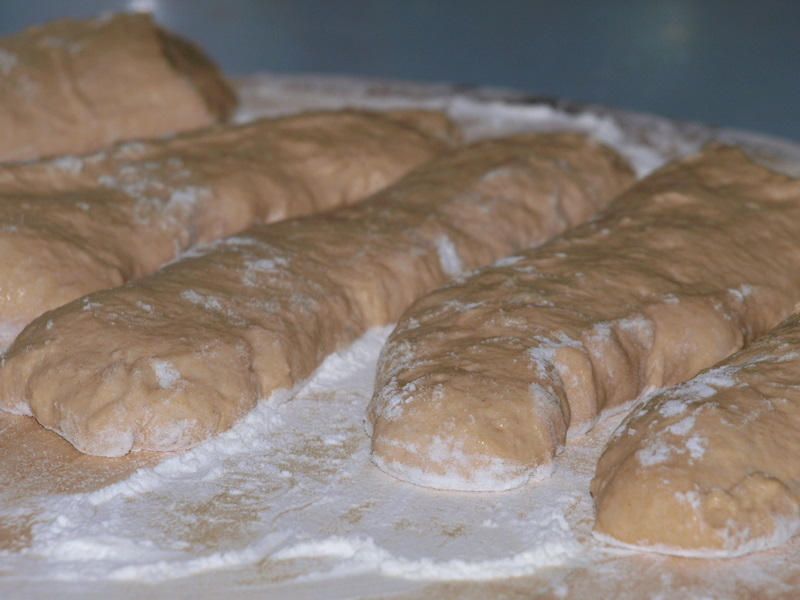 To shape and bake, the dough warms up out of the fridge for an hour before shaping. As gently as possible to prevent degassing, turn the dough onto a generously floured counter and divide into long strips. Using a light touch, gently stretch the strips to 7-9 inches long and place on a floured peel or parchment paper. Bake, directly on a baking stone, for 15-18 minutes in a preheated 475-degree oven until deeply browned (the initial color of whole wheat can deceive–use a probe thermometer and cook to an internal temperature of at least 190 degrees ). 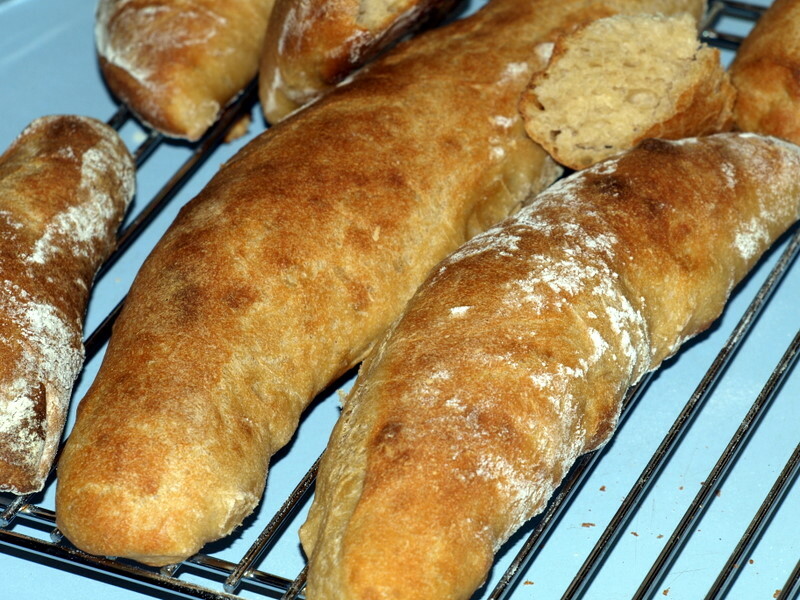 Verdict: this method, known as pain a l’ancienne, requires little activity from the baker. The only tricky part is shaping: rough handling will deflate the dough. A gentle touch yields bread with an airy, holey crumb as good as any artisan bakery….whereas hands of stone equal bread tasting of rocks! See more yeast baking at Wild Yeast’s weekly YeastSpotting, a roundup of breads on the web. This looks lovely. I’ve been debating picking up this book–I own a few of his others, and worried that it might be too similar. I think this post may be changing my mind on that. Thank you! The new book has better wild-yeast sourdough instructions, and almost every recipe allows for a long, cold ferment.